I first read this book four years ago while sick, and I tore right through it! It was my first novel in verse, and it really got me interested in other books told in poems (including Sonya Sones' other great books, What My Mother Doesn't Know and What My Girlfriend Doesn't Know ), leading me to a lot of excellent authors. Ruby's life did a complete turnaround the moment her mother died. First, everyone found out that her father is Whip Logan, the stunningly famous, handsome, and rich movie star, and then her aunt sent Ruby to live with Whip. Ruby is hurt and angry--she doesn't want to live across the country from her best friend and boyfriend, and she certainly doesn't want to live with Whip, who divorced her mother before she was even born. But as Ruby will learn, time and distance can change people, sometimes for the better, and sometimes for the worst. 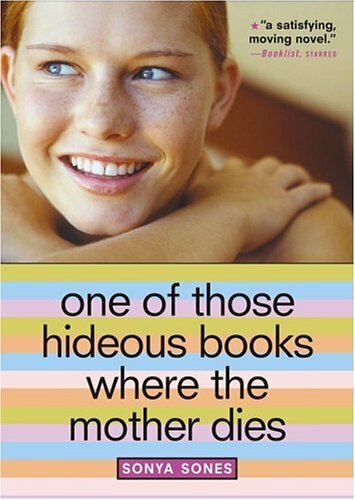 One of Those Hideous Books Where the Mother Dies is written in a series of free verse poems, a good choice for this novel with an interesting concept. Sones balances sadness and grief with the new experiences and love that Ruby finds in LA well, making for a dynamic read. Ruby's grief is tangible in her letters she writes to her mother, and the way she clings to the people of her old life and refuses to accept Whip. But she can't help but be shocked and even a little pleased at all of the things she finds in her new life. Though her hatred of her father and unwillingness to open up to him, despite his earnest efforts, does seem to wear on the reader after a while, Sones' earth-shaking ending will leave Ruby and readers satisfied. One of Those Hideous Books Where the Mother Dies is a humorous, poignant book, and a great introduction to novels in verse for younger readers or those looking to branch out to a new style. Cover Comments: I like the irony in this cover...it shows that the book isn't completely sad and "hideous", and that it;s just as much about life and discovering life as it is mourning the loss of someone. I haven't read this one yet but I adored what my mother doesn't know and what my GF doesn't know, so I'm definitely going to purchase this one day. This was my first verse novel as well. What other authors have you found that write in verse? I adored all of Sonya Sones' books. She is an amazing and talented writer.